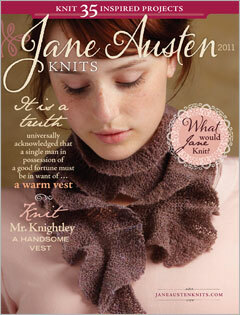 Over 30 knitting patterns for shawls, jackets, socks, hats, mitts, and more. Focus on a variety of techniques such as lace, colorwork, and cables, as well as embroidery for knitting. Fascinating articles that dive into the history, textiles, and characters of Jane Austen’s world. Plus, this issue has a special look at crochet during the Regency era with examples of camisettes and a pattern to create your own. Whether you are an avid knitter, a Janeite, a lover of the Regency era, or all of the above, you will find something to fit your fancy in this magazine. 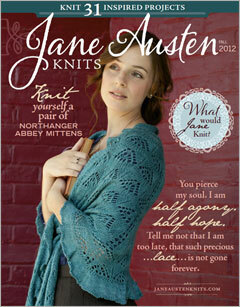 The second issue of Jane Austen Knits, a special issue from the editors of Spin-Off magazine, our Summer 2012 issue explores the Regency era through patterns inspired by one of the greatest writers to come out of this time—Jane Austen. 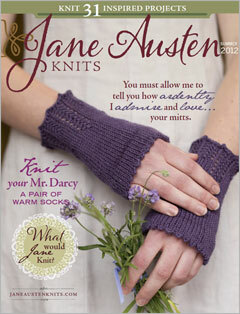 In this issue, discover 30 knitting patterns inspired by author Jane Austen's works and the Regency era. Techniques range from lace to cables for hats, socks, sweaters, shawls and more. The premiere issue of Jane Austen Knits, a special issue from the editors of Spin-Off magazine, it explores the Regency era through patterns inspired by one of the greatest writers to come out of this time—Jane Austen.